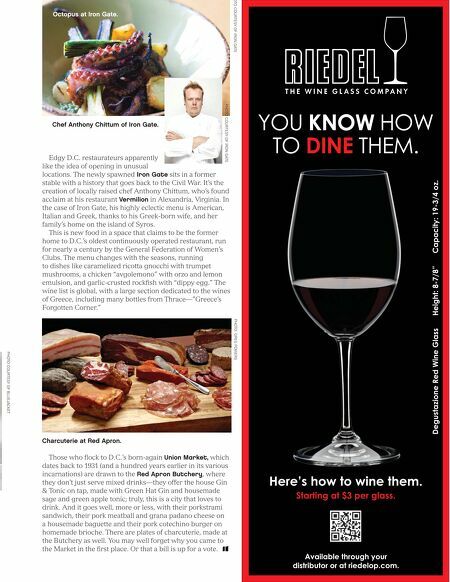 84 / the tasting panel / march 2014 RESTAURANTS THAT MATTER D ining in Washington, D.C. is about Power—not just ﬁrst, but ﬁrst, second and third. The Nation's Capital is deﬁned by Power, and what's on the plate ranks way back in the equation. John Boehner and Harry Reid are more concerned with deal-making than in seared ahi—though they don't eat badly at local legends like the Old Ebbitt Grill, The Oval Room and The Palm. The pols are also good, according to a number of surveys, at bending an elbow; D.C. reportedly has the highest per capita alcohol consumption of any major city in America—drinkers in the capital put revelers in Vegas to shame. But this is also one of the most cosmopolitan cities in the world, with culinary inﬂuence from around the globe. Move away from the Power Spots, and you can and will eat very well in D.C.—especially at our Restaurants That Matter. Restaurants that include the colorful duo of Bluejacket and The Arsenal, a combination artisanal brewery and restaurant situated within a former boiler factory, which still looks like a boiler factory, with industrial design, factory windows and a ceiling 50 feet high. This is a "brewery without borders," with an array of steel tanks on the mezzanine, in which quaffable exotica is brewed—beers with names like The Arsonist, Forbidden Planet and Nine Pound Hammer. Figure 8 is brewed from locally grown ﬁgs. And it's all served with exotic comfort foods, like braised pork cheeks with creamy polenta, braised lamb neck cassoulet and 18-hour beef shortribs with parmesan spaetzle. 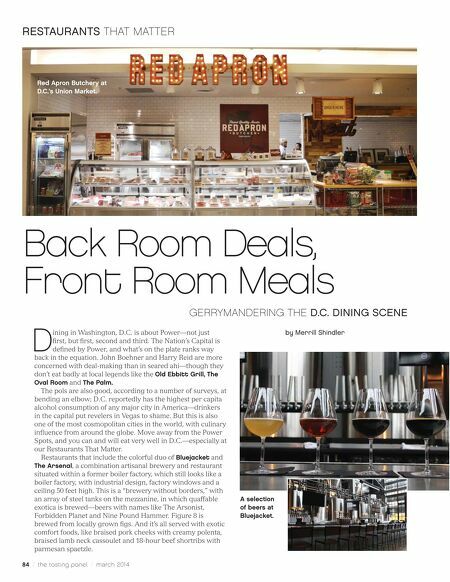 Back Room Deals, Front Room Meals GERRYMANDERING THE D.C. DINING SCENE by Merrill Shindler Red Apron Butchery at D.C.'s Union Market. A selection of beers at Bluejacket.